Orsat Gas Analysis Apparatus with our absorption pipettes of two Compartment type, 100ml gas Burette with outer jacket, manifold with stopcock, and aspirator bottles, palladium asbestos tube, Adjustable spirit lamp for the analysis of CO, CO2, H2 and nitrogent complete in wooden cabinet with sliding door. We are the Leading Manufacturer & Supplier of Orsat Gas Analysis Unit. 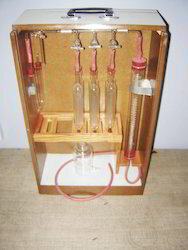 Orsat gas analysis apparatus with three absorption pipettes of two compartment type, 100 ml Gas burette with outer jacket, manifold with stopcocks and aspirator bottle, for the analysis of CO, 0â€ CO2 particularly in fuel and furnace gases, complete in wooden cabinet with sliding doors. Chemical to be arranged by the user. Orsat gas Analysis apparatus fitted in wooden case with sliding doors. - (A) 3 test set apparatus. Orsat Gas Analysis Unit, wit three absorption pipettes of two compartment type , 100ml gas burette with outer jacket , manifold with stopcock , and aspirator bottles, for the analyes of CO .O2 .CO2 Particularly in fuel and furnace gases, complete in wooden cabinet with sliding door. Orsat Gas Apparatus Fischer Type with five absorption pipettes for determination of CO, Co, H, O, . Illuminants methane, ethane and nitrogen by difference. It comprising of four absorption pipettes, two of them plain type filled with glass tubes and two bobbling type pipettes with three ways glass stopcocks. All components in superior wooden cabinet with sliding doors. Glass Agencies EROSE Are Manufacturer of Orsat Apparatus. 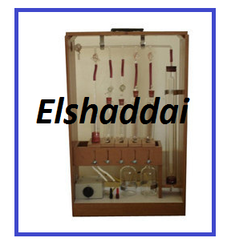 It is used to determine various gases like CO, CO2, O2 etc. - Orsat gas analysis apparatus for 3 test : it is used to determine three gases like CO2, CO and O2. We are dedicatedly involved in providing an excellent quality array of Orsat Apparatus, for catering the various needs of our clients. For determination of various gases like CO, CO2, O2 etc. - Orsat gas analysis apparatus for 3 test. - Orsat gas analysis apparatus for 4 test. - Orsat gas analysis apparatus for 4 test with palladium/platinum asbestos tube. With five absorption pipettes. The manifold and bubbling type pipettes are having PTFE key stopcocks. This analyser can be used to determine CO2, CO, H2, O2, illuminants methane, ethane and nitrogen by the difference.